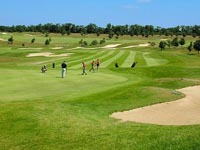 Since 1990 Golf has been marked as an increasing activity in specialised golf holidays worldwide. 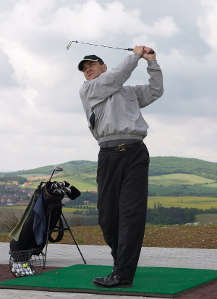 The tradition of golf in the Czech Republic has been successfully developing since the the beginning of 20th century. Exceptionally beautiful surroundings on which Czech golf clubs are established are a great advantage. Among the most attractive courses are the extensive grass courses in Karlštejn, Konopiště, Šilheřovice and Cihelny near Karlovy Vary. The golf course in Mariánské Lázně is placed in an attractive spa environment with magnificent natural sceneries. Edward VII, the King of England founded it in 1905. The golf area in Karlovy Vary has the oldest golf club in the Czech Republic. In Zaloň near Jaroměř, a new large multistyle golf resort called Nová Amerika (New America) offers top-quality services and a unique experience. The 18-hole course at Čeladná promises to make an impression with a magical atmosphere and beautiful views of the Beskydy mountains. Meanwhile region called Kravaře has 9-hole course set in a beautiful English park next to a Baroque castle. The landscape is dotted with hundred-year-old trees and plenty of water hazards. Golf resort Zbraslav or some hotels in Prague are providing Golf courses in their areas like Hotel Cechie and Erpet Golf centrum. Dozens of other golf resorts can be found all over the Czech country, always thoughtfully placed in undulating forest terrains with excellent views of river valleys or in the romantic environment of parks. The basic services provided to visitors include golf equipment rentals, top-quality beginners' and advanced courses and a wide range of complementary sports activities. Some of the top-category hotels have golf courses of their own.